Hello Highlands fans! Where is the time going?! Only 11 more days left of camp. I’m on the countdown big time this year because, like you, I’m missing my own campers. While our daughter’s camp doesn’t post photos, I’ve been able to catch a glimpse or two of my kid over there and while it makes me miss her even more, I see how TAN and HAPPY she is. I can’t wait to hear about her time away. 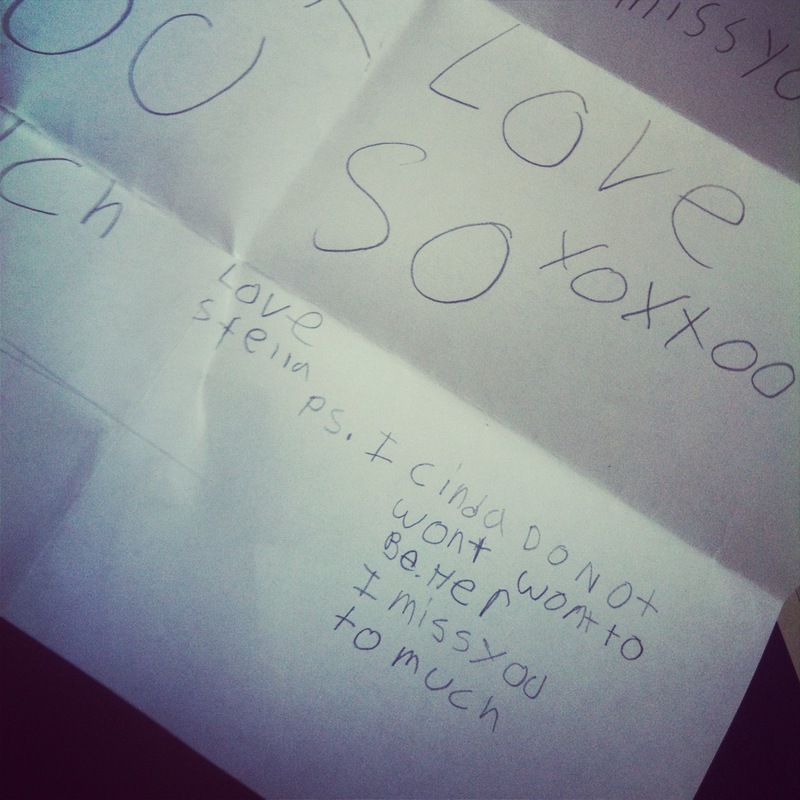 I’m happy to report her homesick letters (the ones where she begged us to “GET HER OWT! !”) have subsided and she admitted at visiting day that she “had kind of forgotten about us.” I consider that success! This weekend was big in the life of Highlands. We turned 110 on Saturday. I feel like we are looking pretty youthful and spry given our ripe old age! We celebrated in traditional Highlands style, with the Steeplechase on Saturday morning. At 7:30 a.m. instead of being woken by the bugle, instead, campers were roused from their beds by the crazy Army/Navy staff entrances. You’ll see photos of this nonsense (staffers sitting on the hoods of cars, the mom in me does NOT approve). But the kids LOVE this. There’s music blaring and it’s a great way to kick off the fun that then ensues. The fun didn’t stop there. 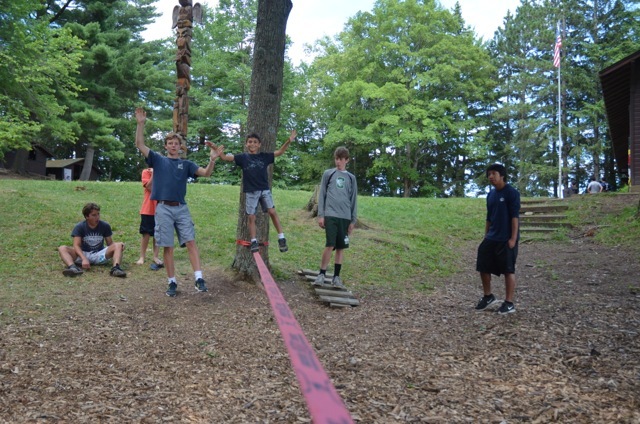 Camp was treated to the senior carnival in the afternoon and a picnic supper and Games on the Hill. 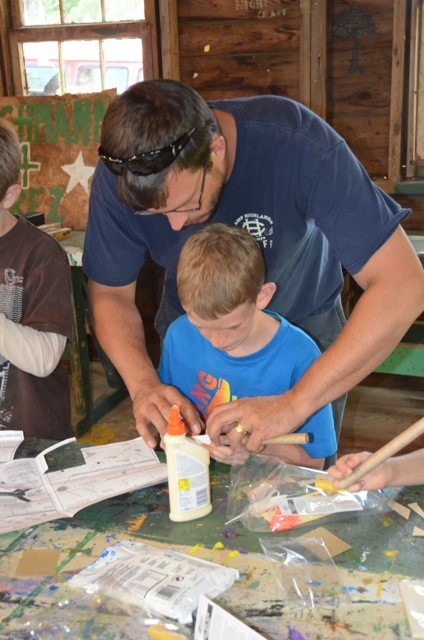 This is a week where many of our oldest campers are out of camp. They have headed off on their big trips to Pictured Rocks, Boundary Waters, sailing in Lake Superior and kayaking north woods waterways, among others. It sort of changes the vibe in camp and lets us act a little smaller. Tonight we’ll be treated to the music of Jim DiDomenico, lead singer of Underwater People, and we’ll roast marshmallows and have a big old dance party! 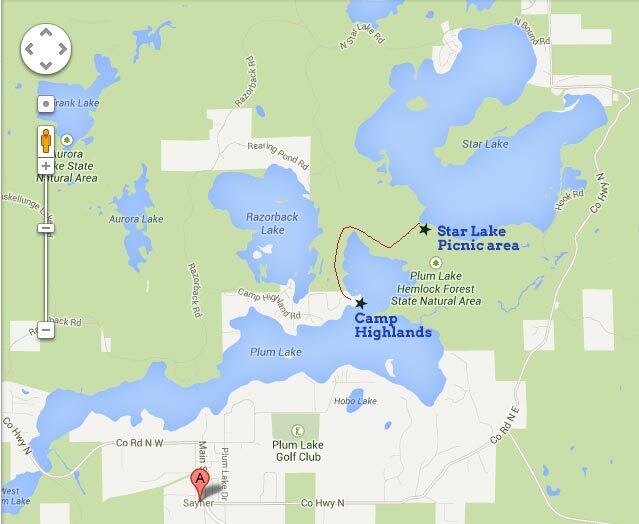 Tomorrow is Division Day and the Juniors will head out of camp to play laser tag and picnic on a local lake. That’s a lot of fun. Keep those postcards and letters coming. It’s not the packages that the boys love so much, but instead the excitement of something real in the mailbox. They check it every day (sometimes 16 times a day). Tomorrow the real zoom-time begins. If this weather could make up it’s mind, that sure would be great! At this exact moment, it’s balmy and over cast. Ten minutes ago it was sunny and warm. As long as it’s not raining, we will take it! This weekend. It’s huge. I mean, you don’t turn 110 every day. We’ve invited alumni and friends of Highlands to help us celebrate. If you are in the neighborhood, we’d love to see you. The Steeplechase starts around 9:30 a.m. and finishes up around 11:30 a.m. At 2:30 p.m. you can be entertained and amused by the Senior Carnival (silly games, rewarded with Bachmann Bucks). You’re invited to eat a picnic supper on Junior Hill, followed by Games on the Hill. It’s an action-packed day! While it’s true we are only half-way through the term, we know many of you are starting to make your end of term plans. If you have not noted your son’s travel home plans on your account page, please do so as soon as possible. Remember the final banquet is on Friday 8/9. You may take your son home that night, or you can take him home before 9 a.m. on Saturday morning. But for now, let’s not talk about the end. Let’s talk about 16 short days of breezy afternoons sailing, shooting bulls eyes at archery, getting up on skis and repelling down the stone chimney on the club house! 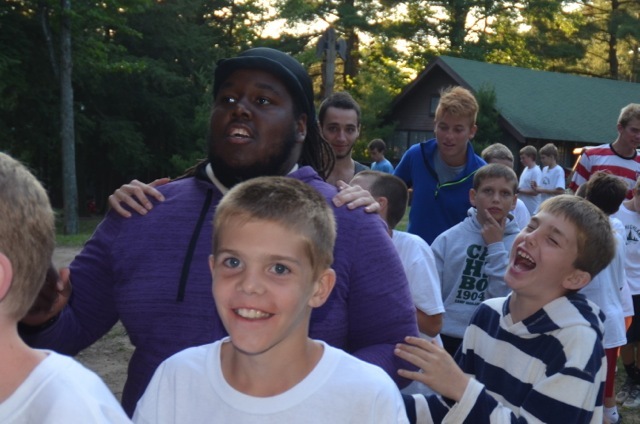 Yo’ T., Noah T., Ben C. and Jordan T. are just some of the incredible Camp Highlands staffer that bring the perfect combo of fun, safety and experience. We probably don’t say it enough, but we are so thankful for YOU. Without you we’d just be a spot on the map. You are special to us in so many ways. From the CIT who taught me the proper way to mix the sanitizing bleach mix for the pots and pans in the kitchen, to the 70+ year-old guy who insures each trip goes out with the right tools and food – we appreciate you. We notice when you take the extra effort to roast marshmallows with your cabin on Five Pines in the evening. We notice when you holler words of encouragement to that boy who is almost to the top of the clubhouse chimney. We notice when you put your arm around a fellow when he’s feeling blue and just listen. We notice when one boy asked another boy to “smell his ice-cream” and then pushed the cone in the other boy’s face, and you didn’t yell at anyone. You said, “I’m waiting to see if they’ll work it out.” And guess what? They did. We notice when you tell your guys to brush their teeth and blow their noses. Really. We notice when you get up at 5 a.m. to start baking muffins and when you stay up until 11 p.m. to put turkeys in the oven. Thank you for keeping our bellies full and happy with homemade food! We appreciate the time and energy you put into keeping Highlands clean and tidy. Lodge staff, we appreciate the hours you spend beating rugs and serving meals to our guests and making sure everyone feels welcome at camp. When you truly appreciate the boys in your cabin – when you laugh at their jokes and make them feel incredibly loved – we notice. You know how you are spending the better part of your waking hours with a zillion boys of varying ages, backgrounds, abilities, personalities and volume control? Well, we know that’s the hardest job out there. We know. In a 17 short days, camp will be over. But long after the last cabin window is pulled closed, the time and energy you put into each boy will continue to permeate their lives – like a slow-release medication. The 11-year old you took a little extra time with in skiing might translate that attention into success in school and with his peers. Can you imagine that? When you showed an extra measure of patience or humor with your cabin, you were modeling powerful behavior. Your dedication to the I’m Third motto, your commitment to the Worthwhile way and your appreciation for the men that came before you is contagious and inspiring. We know Highlands is a special place, not merely a spot on the map. Highlands is a vortex for manhood. A place where boys can try, climb, learn, fail, succeed, fall and soar (in no particular order). And without you, the most powerful ingredient, that magic would not exist. For all you do, we notice and we are thankful. Archery with CIT John M.
It’s always a party at the slack line with Alex M.
As many of you know, Sunday is a quieter day around Camp. There are open activity periods in the morning and a required soap swim before Sunday Assembly. Assembly is a great time for boys to slow down and reflect on some of the changes that might be taking place in their minds and souls during their time in Never-never Land. Today’s reflections offered by Andy and Ross were some of the most poignant we’ve had to date, in my opinion. They talked about being a Worthwhile man, and what it means to be “Third,” but they both came at it today with a fresh perspective and energy. It was great. Ross relayed the story of Lucas Winter washing his trip’s dishes in the freezing cold rain after a 20 mile hike. On his birthday. And Andy relayed the story of being recently rescued from the side of the road by two incredibly generous strangers. It could very well be that I’m just tired, but I got misty eyed when Andy recited the Worthwhile Man prayer, calling specific attention to the verse, that goes, “Give me the strength to stand for right when other folks have left the fight.” I watched the Cubs, our littlest boys, listen to Andy and Ross, completely mesmerized. To me, these are some of the greatest moments at camp. Whether they learn these lessons by actually listening or by osmosis, I’m not sure, but it’s pretty cool either way. If you’ve been keeping track of the weather, you’ll know we’ve had some relief from the heat. Thank goodness! Yesterday was in the low 70s and gorgeous. 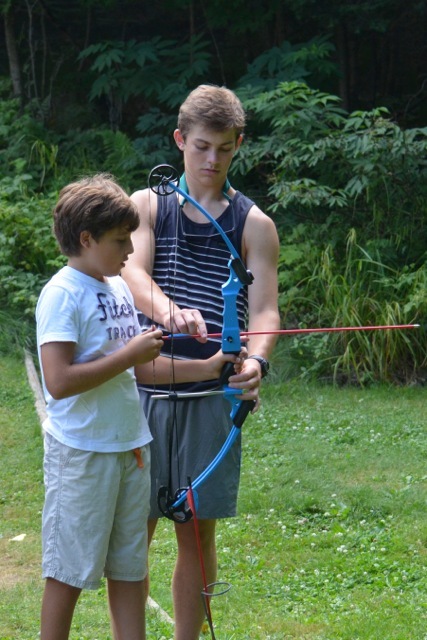 A perfect afternoon for “clubs.” Your guys got to sign up for their selection of: “Top Shot” (riflery competition), soccer tournament, juggling, slack line, Frisbee golf tournament, craw fish gathering for a craw fish boil and model rocket building. Walking around camp, I thought, “man, camp looks fun!” Club days are a great time for boys to hang out with boys not in their cabin, or even in their division! Tonight is “walk-through” dinner, AKA leftover night. Boys have to write a letter to gain admittance to supper! So if you haven’t gotten a letter yet, you can start looking for one mid-week! Just hope that they don’t choose to write their Grammy and Pop first. Two of our big Senior trips to Isle Royal went out this week, and the Colt division (all but two cabins so far) went on their three-day canoe trip. We are all starting to look forward to our birthday celebration this weekend on the 27th. 110!!! Amazing! This is a great weekend to come for a visit. The Steeplechase is a BLAST, and of course Games on the Hill is a big crowd pleaser. This first week has gone beautifully. And listen to this: only 20 more days left. That’s FAST. Before you know it, you’ll have these guys back in their beds, making tons of laundry and eating you out of house and home. Three days into camp. I don’t know about you, but I miss my kids. One is 11 and here at camp. While I do have the benefit of catching a glimpse of him now and again, he hasn’t lived under my roof in going on four weeks. The other one is eight and is at camp for the first time starting this past Monday. I’m in the business of swooping off with other people’s children for three to seven weeks. I talk a mean game when it comes to kids being lonesome for home. We preach about preparation, we talk about what good hands your kids are in, we post inspirational messages from other parents, heck we even broadcast on National Public Radio with New York Times best-selling authors talking about the subject. I’d like to say we know a thing or two about how to deal with the dreaded “H word.” We’re talking about homesickness. Despite all my training and knowledge on the topic, and the years upon years of watching kids thrive at camp – without their parents – I had no idea how I’d feel when I got this letter in the mail today. My first reaction was, “Boy, her spelling is terrible.” My second reaction was, “Oh, poor baby!” I set it down, walked away from it and came back an hour later. I took a photo of it and posted it to Instagram. I texted it to my mom, my sister and my girlfriend. I wasn’t really sure the emotion I was having. Sad? Proud? Amused? Worried? Lonesome for my kid? Yes. So today, in this moment, I’m just excited for her to be there – with so much on the horizon for her – so much to absorb. Canoe strokes, backhand, how to be a decent roommate, and how to overcome feeling homesick. Maybe it’s the Marine brat in me, but at this moment, I’m not worried in the least. Talk to me in five minutes. I’m sure I’ll have changed my mind. Remember moms and dads, your kids will be sending letters home from Highlands that they wrote in their first moments at camp. Take them with a grain of salt. The first week is, well, the first week. It takes time to adjust to any new living environment. Our staff is working around the clock to keep your boys busy and healthy. And they are here to validate feelings of sadness, and to remind them that it’s ok to feel sad, but the idea is to not let it overtake them. Try not to write every day (it can actually make homesickness worse), but when you do write, keep encouraging them and keep it positive. Keep checking the blog and the gallery. Hopefully you’ll get your fix. Be easy on yourself, you’ll adjust, too! And goodness, you only have 3.5 more weeks to go! Let’s try not to wish it away too quickly! What a great day of camping yesterday! Pancakes for breakfast, Meatloaf meatloaf for lunch and tacos for supper. 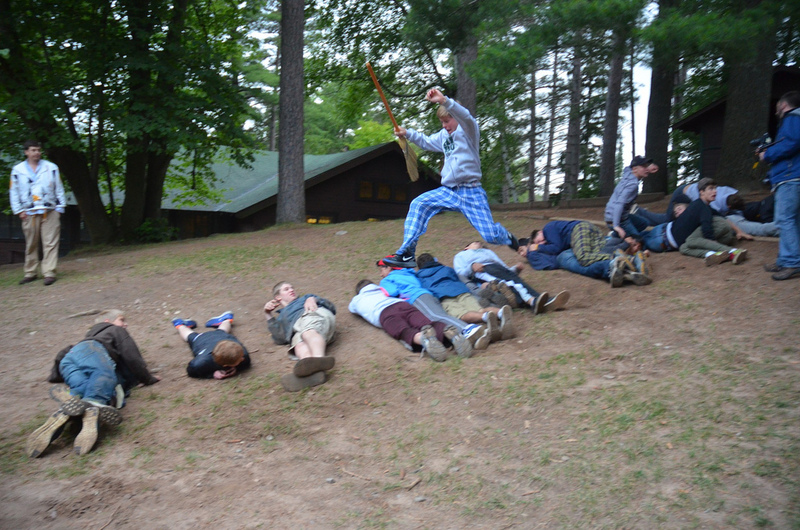 The boys played all-camp capture the flag last night. For the occasion, they are split into two teams, Army and Navy. Cabin assignments and Army/Navy assignments are attached below. Click here for the Army/Navy assignments. Click here for the cabin assignments. Today was muffin and sausage day (my favorite breakfast) and this afternoon is Division Day, where boys hang out as a division. Seniors have a social with Red Pine Camp today and, yes, I’m totally putting Ross on the scene to get a visual on my daughter (cheating!). 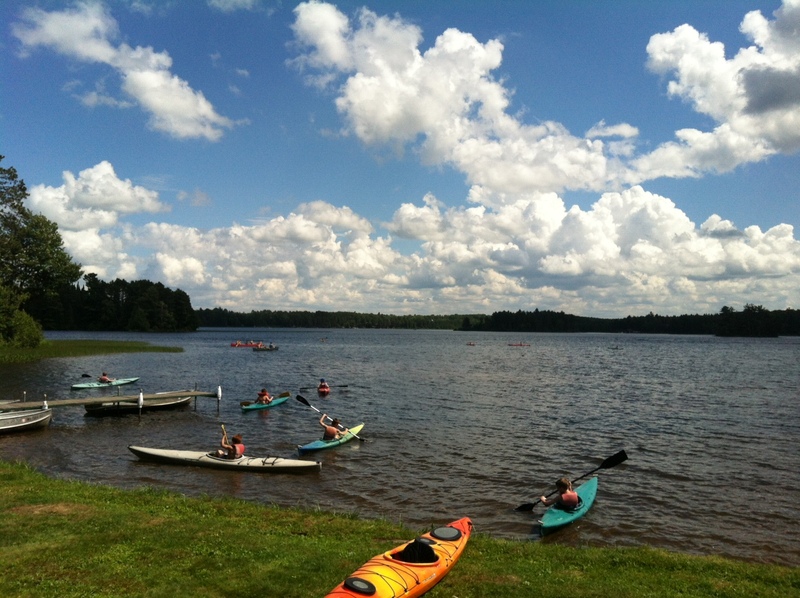 Juniors are paddling canoes and kayaks to the Sayner landing, having a picnic supper at the park in Sayner and playing basketball and softball and then paddling back to camp. Cubs and Colts are joining forces on a short hike to the Star Portage and picnicing on the pristine waters of Star Lake. I mean, honestly, does it get any better?! It’s a hot day here at camp, but the breeze is blowing and we are having a blast. Everyone is starting to get into the swing of things. We always say it takes about a week to settle in. Cub head counselor, Nick Katzmarek calls it the camp circadian rhythm. I talked to a first time camper today and when asked how things were going he said, “This place is awesome! !” We concur! 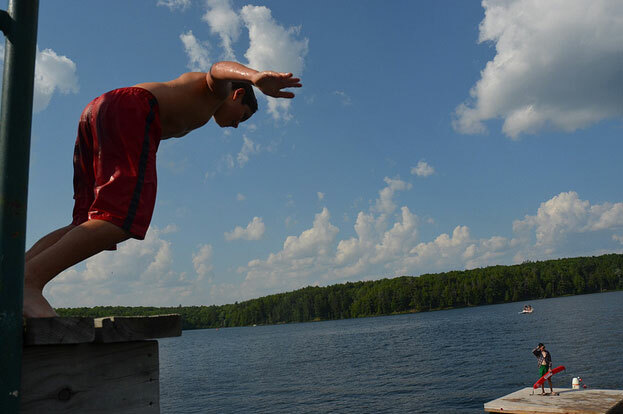 Poised to jump into the best summer of his life. Seriously. This day. 84° F, 28.8° C. A light breeze. Sun. Puffy white clouds. Clear sky. It was a true north woods kind of day. Your boys had safety talks for their first activity period and were OFF! I can tell you that they have jumped head-long into their great summer adventure at camp. I got to see so many boys today that I know and love. Two of my nephews are here (cousin power!!! ), kids from my hometown of Gainesville, FL are here. A whole slew of midwest, Mexican, and Colorado-and-beyond-boys I’ve known since they were *this high,* are here. It absolutely amazes me how much these guys grow at this age. I’m talking FEET here, people. And the voices. They leave as boys and come back a year later with beards. Seriously. It happens. We keep all this growing happening with the most amazing food. Thanks to our nutrition team of Lois Craig (head chef) and Sharon Bachmann (meal planner) these boys eat amazingly well. Did you know we do it old style here at Highlands? (I know this shocks you, 110 years later) The noon meal is called “dinner,” and the evening meal is “supper.” And we must be half Hobbit, because we have two breakfasts, starting with hot and cold cereal and yogurt bar, followed by a hot breakfast like pancakes, French toast, eggs and more. No one goes hungry at camp, no matter how picky. While your boys were off having a blast at activities this morning, Andy B. and I were dropping our second-born off at girls camp for the first time. I’m ok, thanks for asking. I have to admit, I was glad I had some big, dark sunglasses for the event. But it went really well. Partially because of an email I received last night from one of our Highlands moms, Sara Reed. Sara’s a first-timer, just like I am. And her words had me weeping at 11:30 p.m. as I answered my last email last night. One very brave and excited boy chose one weepy Papa to walk him to the plane. One very brave and excited boy kissed his sisters *on the lips* and told them that he loved them. Sisters were brave enough not to register the shock. Later, they said, “That’s the first time he kissed me OR told me that he loved me!” Their delight was evident. One brave boy called approximately eleven hundred times on his phone. He’s in bunk #18. The lake is cool, it’s 7 miles long and his counselor is named Ben but he has NO idea where Ben is from. It’s very pretty here and not too hot. Lots of trees and he likes it. He ate all of the candy and chips we gave him for the plane. He saved the free cookies from the plane for his Papa. One excited sister moved promptly into the brave boy’s room to take advantage of the larger bed. More stuffed animals can fit, you see. The girl was scolded by one Mama who was ready to clean and purge that room. Mama cleaned. Girl skulked and was moody about missing brother. One Papa continued to weep intermittently all day and into the evening. But all told, he did not cry as much as the day that the brave boy was born – when he managed to sob for hours straight, and sobbed at record amounts. Papa announces he cannot live without his boy; however, Papa manages to appear as though currently alive and registers all vitals. “Our boy is gone! I hope he’s okay!” announced the Papa. “Our boy is HAPPY! And he’s okay!” announced the Mama. One great-grandmother called to say she was proud of the parents and thrilled to have seen her oldest great-grandchild have his first out-of-the-home experience. One Mama was filled up with joy at the approval of her greatest Mama-mentor and true love. One Mama took a celebratory nap, cleaned the boys’ room, drank the best wine in the house, took the beloved brave boys’ calls, chided the Papa and knew that above all else: at the right place, in the right time that one brave boy is poised to have the time of his life. HIS life. Well moms and dads, your boys made it! And they are all tucked snug as bugs in rugs. Taps blew for the first time tonight and I betcha these guys will sleep well. The first leg of their summer adventure is complete. Some of them traveled over 17 hours to get here today – making that drive from Chicago seem like a jaunt around the block, right? They arrived on the buses at 5:15 or so, and quickly sorted out where they needed to be. Counselors helped the guys make their beds and everyone headed to the dining room to eat spaghetti at 6 p.m. After supper they had camp fires where the head counselors gave them a quick overview of how camp works. A little what-to-expect-when-you’re-expecting at camp. Tomorrow they’ll get more safety talks, take swim tests, learn the buddy system at the waterfront and more. They’ll be shooting hoops, kayaking and playing football or soccer by 11 a.m.
We are beat here at CH HQ. I’d like to award Ross Freeland with some sort of honor award for most heroic efforts in transporting campers EVER. Ross delivered 13 boys to the airport on Saturday night (with the help of Chris), picked up five boys for an overnight in Chicago, and then picked up ten more boys today (with the help Pablo and Seth). That is remarkable!! Thank you ROSS!!!! I’m a shopper, what can I say. Who doesn’t love a little retail therapy? At Highlands, each boy has a $100 store allowance and we only charge you for what your boy spends. You can feel good that if your child forgets (or more likely, loses) his toothbrush he can buy a new one in the store. 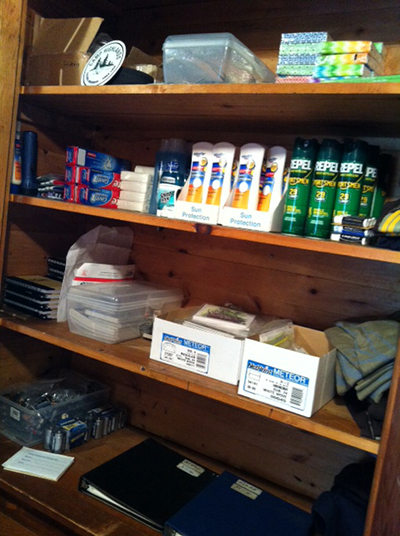 We stock soap, shampoo, chap stick and lots more! Remember parents, you’ll have time to shop yourselves if you are coming up for the banquet on Friday! And if your son qualified for a free store account with early enrollment, it’s a use it or lose it situation! Tell him to stock up on those hoodies! 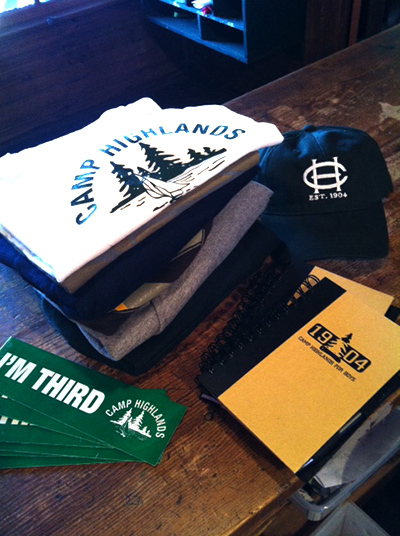 CH swag – what everyone wants! As you might expect, former campers and staff members contact us from time to time to share memories and ask if certain staff is still around. Below is some correspondence we received today. It just astounds me to know that after all these years, when summer time rolls around, Highlands alumni get a little camp-sick (official terminology). Below is an email we got this morning with Mike’s response and a photo to boot. 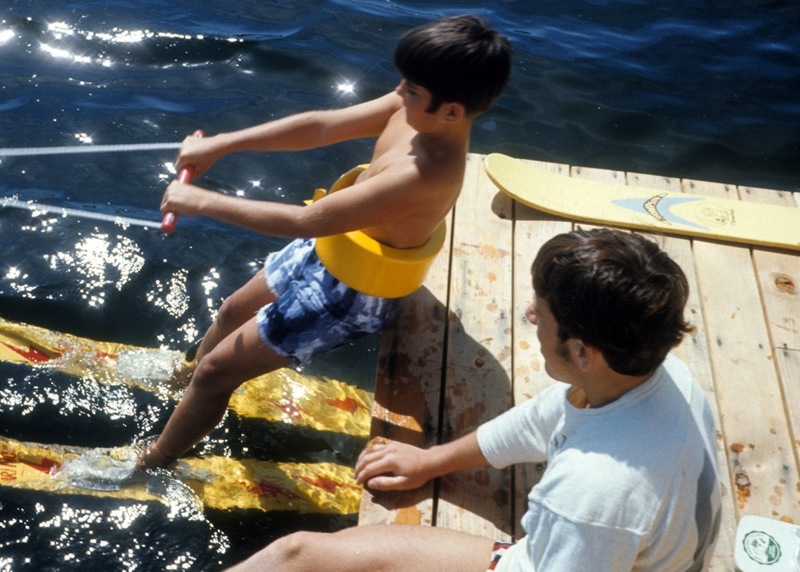 [Can you believe they used to wear water belts to teach skiing!? Yikes! Parent’s, you’ll be happy to know those days are long past. Boys wear proper PFDs!] Remember, we are celebrating our 110th camping season this summer. We are having big alumni reunion the weekend of July 27, the day of the Steeplechase and the camp birthday. Remember, if you need a camp fix, the Highlands Lodge is a great place to stay and relive your memories, and even better is Friends and Family Camp! Hello Highlands! I wanted to pass on my very best wishes for a great summer to all my old friends at Camp. It’s July 5th and memories of track meets (Army Victories!) water carnivals, steeple chases are running thru my head. Who’s General? Has anyone come to lunch with a tie on? And walked off Tower 3!! I will remember my wonderful memories of Camp (teaching Tim Bachmann how to ski behind the Red Highlander with a 40hp Johnson off Cub Midget Pier) Sawbill Trips, and Siedel trail pack dinners for days, and all the great guys and friends especially Artie Kuesel, Jim “Otter” Ott Mike and Sharon on and on. Scotty Nelson teaching Jeff Bayliss to ski. 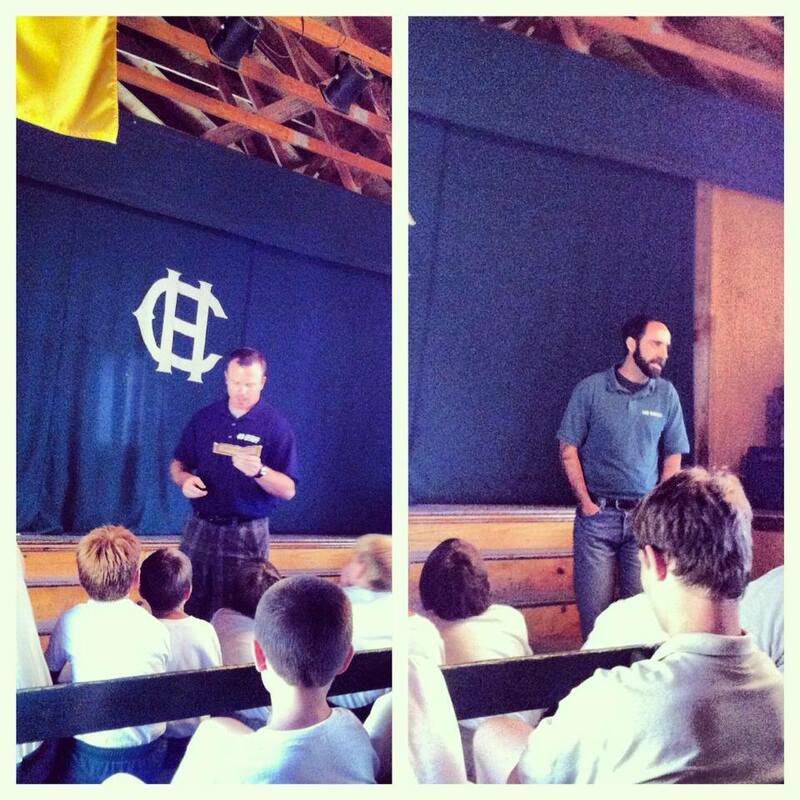 Nelson was a CIT with Dave Baker as counselor. For all the information you asked about and much more go to the web site. The gallery has lots of pictures – even some of Jim Ott!! He is Cub Head Counselor. In fact, Otter asks about YOU often. You had better give us a good update. We are having a gathering time on the Camp Birthday this year. Butch will be up, and Jaimie Casas intends to come. It will be July 27. Steeplechase, Games on the Hill – you know the routine. Some things are not supposed to change. Of course we are way past 40 hp ski boats. Dave Baker and Kent Taylor are running the trip room. Artie Kuesel has two sons on the staff. He stopped by yesterday. Ross Freeland is Senior Head Counselor – that is Jani’s son. She, Sharon, and Jill are all here this summer. Alec Winter is David’s son. He is an assistant counselor. Facebook is also pretty busy with regular updates. Here is a photo of a ski instructor you may recognize. Thanks for touching base. Now come visit! !